Around the world today, living in settings hostile to Christianity, there are many secret believers. I had the blessing of meeting, knowing, and being friends with some of these believers during the fourteen years I lived in a Muslim majority nation. Being a secret believer basically means that a person believes in Jesus but does not openly declare this fact. They may share it with a small circle of Christian friends, but they are very cautious. The reason for their caution and the reason they remain hidden is that open declaration of their belief in Jesus as their Lord and Savior could result in them being expelled from their family and home, losing their job, being imprisoned, or even physically attacked or killed. One of the first secret believers is mentioned in all four gospels as part of the Easter story. His name is Joseph of Arimathea. John tells us explicitly that Joseph was “a disciple of Jesus, but secretly for fear of the Jews” (John 19:38, ESV). Is it Right to be a Secret Believer? Based on this, some might question rather it is acceptable to be a secret believer. But Luke tells us that Joseph of Arimathea was “a good and righteous man.” It is hard to see how John could call Joseph a disciple of Jesus and Luke could call him good and righteous if Joseph was living a life that was not pleasing to God. Being a secret believer is not the same thing as denying Christ. At some point a secret believer may indeed be called on to openly declare her faith in Jesus. They certainly should not explicitly deny it. But that does not mean they are required to openly state it in every setting. Jesus told his disciples that in the hostile world where they would be ministering they would need to be “wise as serpents and innocent as doves” (Matthew 10:16). Being innocent meant that they could never compromise with evil in order to avoid persecution. But being wise sometimes means knowing when to be patiently silent until God opens the door to speak at an opportune time. 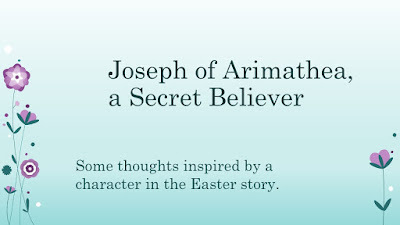 Joseph’s part in the Easter story is small, but it is important. It is important enough that he is mentioned in all four gospels. Joseph could not prevent his fellow religious leaders in the Sanhedrin from carrying out their evil plot to have Jesus crucified. But there is one thing he could do. He could provide a decent burial for the body of Jesus. This burial proved to be part of God’s plan to provide a good setting for the discovery of the resurrection, first by some of the women who were following Jesus, and then by the other disciples. However, in order to provide this burial for the body of Jesus, Joseph had to ask Pilate for his body. This involved a great risk. He might be viewed as being on the side of the guy who was just flogged and killed. Mark tells us that Joseph “took courage” (or “dared”) to approach Pilate (Mark 15:43). In a similar way, God will occasionally call on a secret believer today to take some action that requires courage. This is the kind of courage that only comes from the Holy Spirit. They may not be asked to publicly declare their faith, but they might be moved by the Spirit to quietly take a risk and witness to a friend or family member. This was sometimes the case with the secret believers I knew. Often the risks they took did not result in any suffering. Sometimes it did. I shared the story of one such believer, whom we call Lily, in a previous blog post. If, like me, you live in a place and time where the risk of violent persecution as a result of openly identifying as a disciple of Jesus is low, you may feel that the story of Joseph of Arimathea has little relevance for your life. However, there are several important applications that may apply to us. 1. When the Apostle Paul was chained up for his gospel witness, something surprising happened. You might think that other Christians who heard about it would become more timid and quiet. 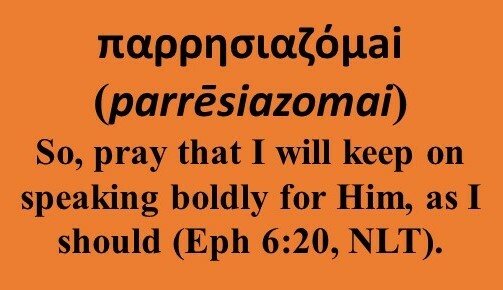 But Paul wrote, “And most of the brothers, having become confident in the Lord by my imprisonment, are much more bold to speak the word without fear” (Philippians 1:14 ESV). In a similar way, reading about Joseph of Arimathea and hearing about the courage of secret believers around the world today can encourage us to take the relatively small risks God asks us to take in sharing His truth and love with our neighbors. 2. We can help Christians in hostile settings around the world by praying for them and by supporting ministries that work with them. The author of Hebrews wrote, “Remember those who are in prison, as though in prison with them, and those who are mistreated, since you also are in the body” (Hebrews 13:3 ESV). One of the many wonderful things about prayer is that we can pray for people we have never even met (see Colossians 2:1). 3. We can draw encouragement from the example of Joseph of Arimathea if we or someone we know is in a similar situation. While violent persecution against Christians is thankfully rare where I live now in the US, there are still situations where Christians need the right balance of wisdom and courage, of being “wise as serpents and innocent as doves.” This happens because some part of God’s truth that they believe could cause them to lose their job, their position, or face painful conflict with their family and friends. Some scientists who believe that scientific evidence points to God’s creative acts rather than evolution are very cautious about sharing this because other scientists have lost jobs over this belief. Today, simply sharing that you agree with the biblical teaching that homosexual acts are sinful could cause you to lose your job. Sometimes a pastor or a church member will discover a biblical truth that is different from their church tradition. I know pastors who have lost their jobs when they saw the doctrine of conditional immortality in the Bible (even if you don't agree with the doctrine of conditional immortality, I hope you can see how wrong it is to fire a pastor over a secondary issue like this one). They were not pushing their new view, but they were in situations where integrity required them to acknowledge it and then they were fired. They remained “innocent of doves,” but like many faithful believers they suffered for God’s truth. In situations like these we are sometimes called to speak out clearly and boldly and sometimes even publicly. But other times wisdom and guidance from the Spirit may lead us to be a type of “secret believer” for a season, until God asks us to take a risk. Being in the position of a secret believer of any type is hard and stressful. 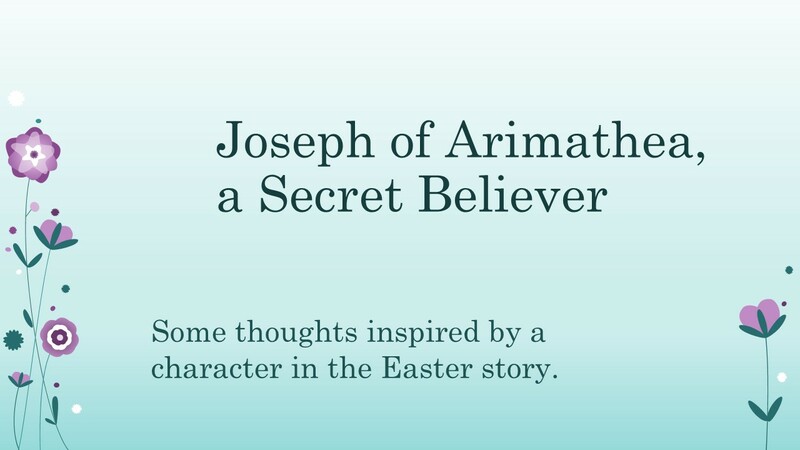 We can find encouragement from a man who had a small, but important, role to play in the Easter story, a “good and righteous man,” Joseph of Arimathea. My purpose in this post is to address some problems with a particular class of universalist arguments. I’ve encountered these types of arguments repeatedly. First, I’ll try to explain the type of argument I’m referring to, then I’ll seek to show its weaknesses. In referring to the final fate of the unrighteous, New Testament authors employ a range of very strong Greek words that point to death and destruction. In fact, when the Greek philosophers Plato and Plutarch wanted to discuss the possibility of the complete, total, and permanent annihilation of human souls after the death of the body, they used some of these same words (you may see an article explaining this in detail here). The Bible even says that the unrighteous will be burned up and turned to ashes. This language of destruction and ashes sounds a whole lot more like annihilationism than it does universalism. How does the universalist respond? The strongest (or, more precisely, in my opinion, the least weak) universalist response is to admit that the biblical language speaks strongly of destruction but to then claim that this destruction is not the end of the story for the unrighteous. They correctly point out that in the Old Testament there are many terrible judgments from God and that these judgments are described in very strong language, but that God then restores the nations and cities that he judged. Ezekiel even speaks of Sodom being restored, and they were burned to ashes (Ezekiel 16:55)! In addition, they point out that God uses suffering and problems to purify his children for their ultimate good. That’s also true. Based on all this they go on to argue that while the unsaved may indeed experience severe judgments after death, all such judgments have the ultimate purpose of bringing the lost to salvation. They argue that the purpose of the postmortem fire of judgment is to purify, not permanently consume, those who were not saved by faith in Christ prior to death. Paul knows that God’s judgments in the Old Testament on nations and cities were often followed by restoration. He knows that God uses suffering in our lives to refine us. Yet, Paul reaches the opposite conclusion from that reached by universalists. The universalists say that while there is destruction for the ungodly, that is not their end. Paul says, “Their end is destruction” (Philippians 3:19a). Where did the universalists go wrong? Part of the problem with their arguments lies in the nature of extrapolation. When it comes to what happens to the unrighteous after death, the Bible says nothing directly about their being purified, or eventually coming to faith, or eventually being saved. Universalists don’t claim that the Bible explicitly says this. Instead, their argument is an extrapolation. 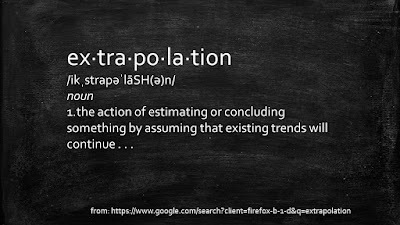 Extrapolation involves taking known truths in one setting and using them to make predictions about things that are unknown in a different setting. The universalists know (correctly!) that in the Old Testament even terrible judgments like the destruction of Jerusalem and the exile to Babylon are often followed by beautiful restorations. They know that God uses painful suffering in our lives to produce glorious good in the future. Based on this knowledge they then go on to predict that something similar will happen after death for the unrighteous. However much suffering and destruction they may encounter, it will eventually end in their eternal salvation. This prediction is an extrapolation. Extrapolation is not inherently bad or wrong. In fact, it is a reasonable way of predicting what will happen in an unknown situation when we don’t have direct information. Extrapolations are often correct, or at least approximately correct. But this method of reasoning must be used with care. In some cases, extrapolating can lead to large errors. In order to illustrate specific problems with universalist extrapolations, I will discuss an example from the context where I first learned about extrapolation. This example is from the field of physics (specifically thermodynamics). Don’t let that scare you. The basic ideas are pretty simple. This will provide a (hopefully) helpful analogy to use when considering the universalist extrapolations. Imagine a student came into class to find the pop quiz on the chalk board as shown above. Notice that the chart only contains data up to 100 °F. 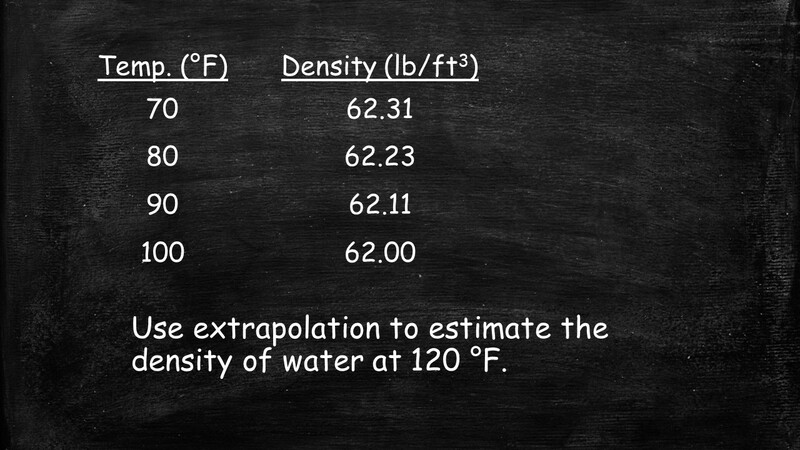 However, the student is asked to estimate the density of water at 120 °F. She can easily do this by extrapolating. Extrapolating involves assuming that the trend in the given data continues to hold steady. I won’t bore you with the math, but if the student used a simple straight line extrapolation based on the last two data points, she would come up with an answer of 61.78 lb/ft3 (to the majority of the world that uses the metric system, please forgive my use of English units). This answer turns out to be very close to the actual density of 61.73 lb/ft3. This is an error of less than 1%. In this case, extrapolation works very well. But now imagine that later another student decides to use extrapolation based on the same data to estimate the density of water at sea pressure at 230 °F. 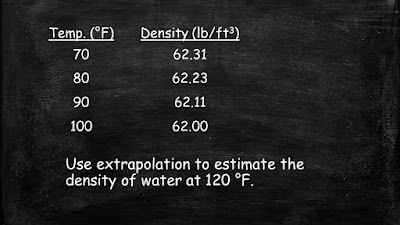 Using the same method, he extrapolates and estimates the density will be 60.57 lb/ft3. While he did the math correctly, his answer is massively wrong. The actual density is 0.051 lb/ft3. His answer is off by a factor of over a thousand! What went wrong? 1. Extrapolation becomes less and less accurate the farther out you extrapolate. 2. Something happens to water at 212 °F. It boils and becomes steam. Extrapolation only works well when the circumstances between the facts you have and the situation you are extrapolating into are very similar. If you cross some kind of boundary (like the boiling point), all bets are off. In some cases extrapolation might still work, but in many cases when you cross a boundary extrapolation will produce wildly wrong results. When universalists use examples in the Old Testament that refer to how God treats nations and groups of people in this current age to predict how He will treat people in the age to come at the final judgment, they are making the same two types of mistakes. 1. They are extrapolating a long way into the future. 2. They are crossing boundaries. They are crossing the boundary of death and they are crossing the boundary from this current age into the age to come. Although universalists begin with some good data, they go wrong when they extrapolate that data beyond death and the current age to predict how God will treat the unrighteous at the final judgment. I was an assistant teacher in a thermodynamics class where students had to use charts to find the properties of water at different temperatures. If I forgot to give them the chart for steam, and a student used the chart for liquid water and extrapolated, they would get a wildly wrong answer. But because I failed to give them any other data, how could I have blamed them? But if I had given the students two charts, one for liquid water and one for steam, and a student extrapolated from liquid water instead of using the steam chart, then the student would fail that question. Thankfully, God has not given us only one chart. God has not given us only information about how He treats nations and cities in this age and how treats Christians whom He disciplines in this age. We don’t have to extrapolate (which is a form of educated guessing based on limited data) about what God will do with the unrighteous in final judgment. He has told us clearly. He will destroy both their bodies and souls (Matthew 10:28). He will consume them with fire (Hebrews 10:27), burn them up completely (Matthew 3:12, 13:30), and reduce them to ashes (2 Peter 2:6). They will die a second death (Revelation 20:14). This destruction will be an “eternal destruction” (2 Thessalonians 1:9) and this final death penalty will constitute an “eternal punishment” (Matthew 25:46). The Bible speaks quite a bit about the final fate of the unrighteous. Never once does it mention any redemption after death, or any rescue from the lake of fire, or any restoration for them after they are destroyed. All the biblical language points towards permanent annihilation for the unsaved at the final judgment. Universalists should stop extrapolating and base their views on what the Bible says will happen to the unrighteous rather than on what they guess will happen based on parts of the Bible that are not discussing the final fate of the unrighteous in the age to come. I can understand why this argument may ring true for some people. The Bible does discuss our old self being crucified (Romans 6:6), crucifying the flesh with its passions and desires (Galatian 5:24), urges us to “put to death the deeds of the body” (Romans 8:13, see also Colossian 3:5), and speaks of us being refined by fire (1 Peter 1:7, Isaiah 48:10). Pastoral note: You are reading this post because of your interest in the final fate of the unrighteous. However, I feel prompted in my heart to say that for some who are reading this post, the most important thing in it may be a reminder that God wants you to focus on killing sin in your life. If this resonates with you, you may want to read this post on fighting against sin. I’ve prayed for you! Now back to universalist arguments . . . There are two related fatal problems with this universalist argument. 1. When the Bible speaks of the final judgment and the final fate of the unrighteous it never, not once, uses the same type language about being refined or crucifying sinful desires that it uses when addressing Christians in this current age. Many more examples could be given. It is ungodly people who will perish, be destroyed, and burned to ashes, not merely their sins. You may find more resources on the topic of Hell at Mark’s Resources on Hell and at Rethinking Hell. May God guide us all into His truth. While we are still each groping to more clearly understand all He has revealed, may He also guard our unity and give us grace.